Since I was a young girl, I’ve adored flowers, plants and trees. In fact, I come from a long line of ‘green thumbs’ on my mother’s side of the family. My house is home to many house plants that decorate my living space. Funny that I never really stopped to ask why I have this deep love for the plant world. My curiosity about nature and it’s healing power has increased dramatically as I’ve gotten older. 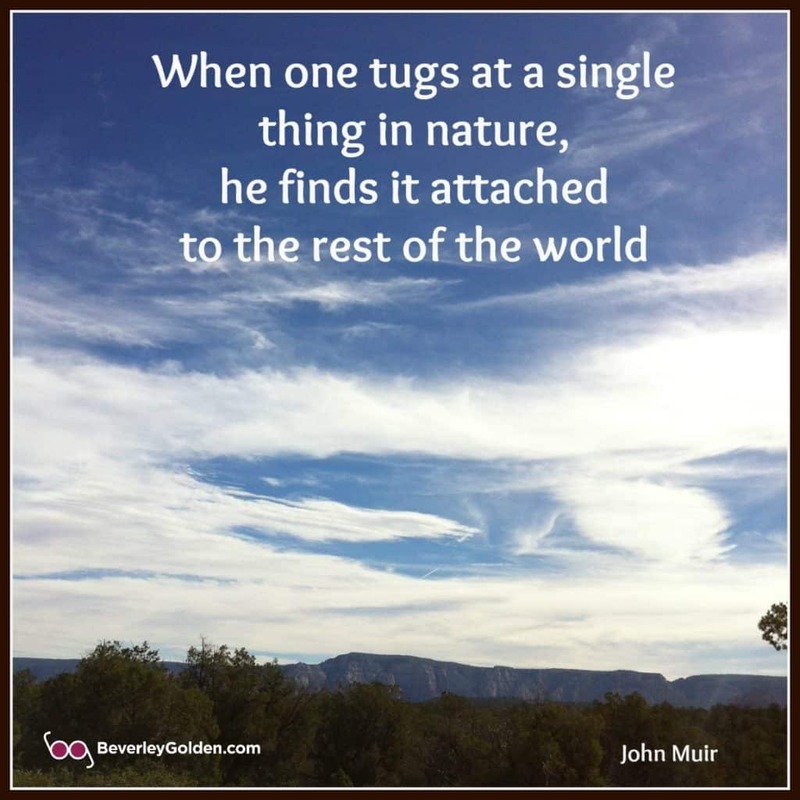 So, when I received a random email from a fellow writer who had found my piece “Rediscovering Our Humanity Through Nature“, I was sparked by what she shared. Having worked in the health and social care field, she supported patients with dementia and other long-term mental and physical conditions. How? In their work, they’d discovered that patients benefitted from looking at nature, or even simply studying scenes from the natural world. Having personally experienced this, I was off to find out more! Having just read “Brilliant Green”, by Stefano Mancuso, a leading scientist and founder of the field of plant neurobiology, I was fascinated by his findings. In the book, he presents a new paradigm for us to understand the plant world. Mancuso, combining a historical perspective with the latest in plant science, argues that, due to cultural prejudices and human arrogance, we humans continue to underestimate plants. Isn’t that just like us humans? Would you be surprised to hear that plants may even have 21 senses, while we humans have only 5? I’d also just read an article about how urban trees are not getting enough sleep due to street lights. Peter Wohlleben, author of “The Hidden Life of Trees” reported that “They (trees) also have to sleep at night. Research shows that trees near street lights die earlier. Like burning a lamp in your bedroom at night, it is not good for you.” How many of us even stop to think about that as we walk by a tree in our own neighbourhood? Have you heard the term ‘biomass‘ before? I had, but wasn’t sure exactly what it meant. As it turns out, the bodies of most plants and animals consist primarily of organic compounds and water. The entirety of this mass is called the biomass. The term refers to the mass of all the living creatures in the world. Plus the mass of anything that has died but not yet decomposed, such as the leaf litter on a forest floor, or dead tree trunks. Consider this. The biomass on land surfaces is more than 99% plant material and less than 1% animal material. You read that right. The plant kingdom rules, while we humans are the minority on the planet. This fact was incredibly profound to me, with enormous implications if we stop to think about it. Another reason for me to have even more reverence for the plant world. Wouldn’t it be wonderful if more people felt the same. We’ve all taken a walk in nature and experienced the relaxing and often regenerating, healing impact it can have on us, right? What is it exactly? “Taking in the forest atmosphere” or “forest bathing”, refers to the process of soaking up the sights, smells and sounds of a natural setting to promote physiological and psychological health. Well-known environmental activist David Suzuki talks about how the heart of many of our modern-day problems is the separation of humanity from the natural world. Our ongoing belief that the economy is a living ‘thing.’ We don’t have to look too far to see that dominating belief, do we? The recurring message is that man has become disconnected from the natural world and from ourselves. We’ve become slaves to technology and won’t leave home without it. We’re more interested in ‘capturing’ nature and sharing it online, than experiencing and living it in the moment. Can you relate to this? Maybe this is why on vacations we flock to the ocean, or to the mountains, to be in nature. We’re moved by breathtaking sunsets or sunrises, in awe of nature’s wonder. City dwellers rarely get to witness these without making a conscious effort. With the estimate that by 2050 more than 70 per cent of the world’s population will be living in urban centers removed from contact with the natural world, we can see how this is increasing our disconnect from it. As a rose-coloured glasses optimist, I believe there is something we can choose to do! Maybe it sounds simple, but what if we committed to ourselves to take time each day, week or even every month, to actually get out in nature. To unplug from technology and inhale and absorb the many health benefits nature has to offer us. As a species, we would be so much better off. Maybe we would collectively take saving our planet more seriously too. Are you willing to make that commitment too? ps. This piece originally appeared on the Huffington Post on July 10th, 2017. Beverley, So much value in this piece. I learned a lot about the healing aspect of nature. Maybe that’s why as a kid, I’d enjoy going into our fields and lie on the grass, watching the clouds go by. It could explain that my husband and I love camping so much and sleep so much better being outdoors, in nature. It’s why we go to the beach and take long walks and feel so relaxed. This piece has been inspirational in helping me firm up decisions around our living arrangements. So happy this article offered some new insights about the healing power of nature, Claudette! I do think as kids we have an intuitive connection to nature. Sad that we lose it as we grow up and get so busy with our lives. It sounds like you and your husband have a very simpatico way of living and I know you are looking forward to the future and experiencing more time together in the natural world. The beach and camping are both incredible ways to spend time together in nature. Enjoy! Tnad thank you for your support for my writing! It is a great that you have a green thumb. I don’t. Thank God my husband does! He takes care of our plants at home. We both enjoy nature and when we travel, we try to incorporate seeing natural wonders on our journey. In our city, I try to also maximize the warm weather by driving to a great location where I can experience nature. It’s wonderful that you husband is the green thumb of the family, Lorii! It means you have plants in your life and he is nurturing them. It sounds like you both love nature and include it in all your travel plans, which is a fabulous activity whether you are close to home or not. Yes, I love the warmer weather too and can’t wait to be out in nature, enjoying the fresh air and natural beauty around me. Enjoy your times in nature too! I love this post. I’m an avid nature-lover. I’d hug lots more trees, too, if I wouldn’t look so silly in busy NYC! Yes, everything you write is true. I’ve always felt it, too, and, like you, I’m learning more about the why’s and wherefore’s of it as more information about plant intelligence and sentience comes to light. Even the thought of nature is grounding – how much better to go and bathe in a forest. I can’t wait for my next opportunity! Thank you Reba! I know you love nature as well and living in NYC, I guess it’s challenging to get deep into the heart of nature without some effort. I guess Central Park is a good place to hug a tree, based on my brief experience in the south end of park. I agree that we are learning more about the intelligence and sentience of our plant kingdom and the more that comes out, the more fascinating it is. Now for that information to gain hold in more people’s consciousness, so that maybe how we treat the natural world around us with more reverence. Fascinating information, Beverley. I loved the John Muir quote; if there is any place on earth that should be visited for “forest bathing,” it’s Muir Woods in California. What a magnificent, holy place! And yes, I know exactly what you mean by paying more attention to capturing the beauty of nature — which is never as good as the real thing — instead of enjoying it in the moment. I have made a special point of leaving my phone (with its camera) in my pocket on my walks, and just enjoy what I see and sense (with my measly 5 senses ;-)). Beverley I always enjoy your writing and this especially touches my heart. Angelo (my pup) and I walk the river daily and it is probably my number one health support. I love when science starts to prove what we know in our hearts and souls. Thank you for a beautifully written and educational article. Thank you so much Candess! I really appreciate your support for my writing and am delighted to hear that this post really resonates with you. It sounds like ou and Angelo have a beautiful daily routine and that both of you are experiencing the health benefits too. It’s wonderful that science is finally showing us what our hearts and souls already know. 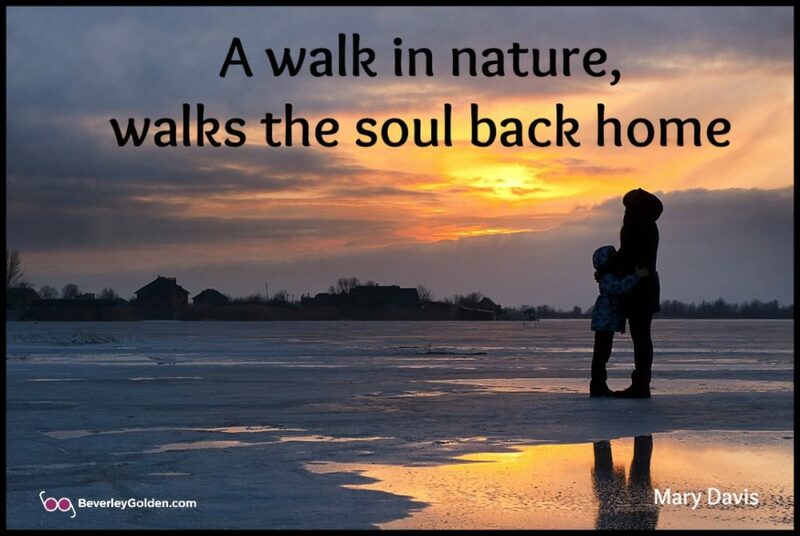 May more people reconnect with the natural world. Our planet would be a kinder and gentler place. I hope that I don’t go bankrupt because I have been in nature for going on two weeks now (in the mountains). I am so addicted to the feeling of calm that washes over me and it won’t leave until I do. So I cannot bring myself to leave. While the ocean is my fave, it seems that whether I am nestled in the foothills or suspended among the treetops, I am thinking that a mountain getaway is unlike any other. The air is crisp, the wildlife is captivating and the views just take my breath away. Nature is definitely a tool for healing, as you stated. It is our chance to feel totally alone and at peace—and yet, completely in sync with the stunning nature that surrounds us. I know how much you love spending time in nature, Rachel, especially knowing that you are close to both the mountains and also to the beach. My sense is it is an important part of your life and maybe even gives you the balance you need between your business life and your personal live. I agree with you that there is something about hiking in a mountain or foothill setting, as it is the perfect place to commune with the natural world and all of its inhabitants. We don’t necessarily have that same experience near the beach. Yes, nature is a tool for healing and my wish for all people is they take the time to spend time in nature as often as possible. There is so much disconnection from the natural world, the effects of which can be seen in how people are removed from the environment and animals. We are all connected and hopefully we are moving back to the time we were all connected to the natural world around us. I believe that no matter what one’s preference is (mountain , ocean, forest or desert), there is nothing like spending time in nature to ground you back into your body and connect you with a great sense of appreciation for the earth and for life. My favorite is the ocean; however, I love it all. I agree with you Rachel! Anytime spent in nature, is a time for learning, being inspired and re-energized for me as well. I love the ocean, but do love the desert as well and forests too. I guess like you, I love them all!